[Translate] A high end sushi experience in Japan can be intense and uncomfortable sometimes with the formality and etiquette, the inevitable language barrier and the hefty price tag. Sushi Iwa 鮨 いわ, located in Ginza, is a high end, 1* Michelin restaurant that serves excellent sushi without the snobbery. Sushi Iwa’s entrance is at street level. It is recognizable from its classic wabi-sabi (tea-ceremony style) look, hempen curtain, bamboo trellis window and small iron lantern at foot level. Inside, it feels relaxed and, with a counter only big enough for six, surprisingly intimate. Owner-chef Hisayoshi Iwa learned his skills at..
[Translate] Hilton Conrad Tokyo, opened in 2006, is located on floors 28 through 37 in a high-rise building in the Shiodome area of Tokyo, the Conrad is a 290-room, premium-service hotel that caters to business travelers and tourists who want to be near downtown. The hotel is also a 10-minute walk from the very popular Tsukiji Fish Market. When we entered their ground floor elevators up to the 28th-floor check-in lobby, we were welcomed to a double-height space that looks out onto Tokyo Bay. The interior illuminated by glowing lightboxes and floor-to-ceiling wood paneling, the décor of the hotel is..
[Translate] Four Seasons Tokyo at Marunounchi. It’s in the heart of the business district and it is boutique hotel with 57 rooms. This hotel is designed by Yabu Pushelberg; Andre Fu designed the hotel’s restaurant Motif. It’s chic and modern; decorated with warm, neutral tones and accents of wood. It makes you feel comfortable but it’s all luxurious. We whisked up to the seventh floor to the hotel’s restaurant Motif for afternoon tea. Seated at lounge area of the restaurant, The hotel’s teas are by a German tea brand Ronnefeldt (this brand started in 1823). 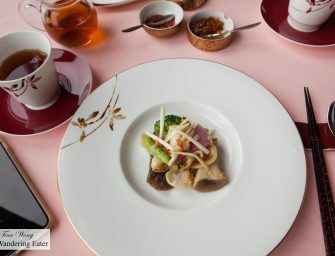 Since it was a humid..
[Translate] In a city that has the most Michelin stars in the world, Mandarin Oriental Tokyo takes pride of their awards and stars seriously. Sense at Mandarin Oriental is a 1* Michelin Cantonese restaurant in a 6* diamond, luxury hotel. 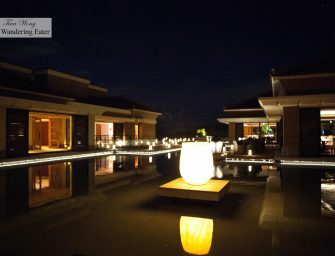 Other restaurants within this hotel that share this prestige are Signature (French) and Tapas Molecular Bar (molecular gastronomy). When I arrived to the 37th floor and was greeted by the sight of sleek, dark wood and black marble restaurant with tables covered in heavy cotton candy pink tablecloth that reminds me of my childhood dining at Chinese banquettes. The best..
[Translate] Tokyo Mise is located on the ground floor of Corredo Muromachi 3 in the very upscale district Nihonbashi. It is both a sit-down tea salon and a retail space where one can pick up a couple of sweets to go. Tokyo Mise is founded in 1803, headquartered in the Nishijin district of Kyoto and serving wagashi (traditional Japanese sweets) that reflect the four seasons and based around the Japanese tea culture, including matcha green tea. Tsuruya Yoshinobu (Tokyo Mise’s parent company) expanded to Tokyo’s Nihonbashi area for clients to savor freshly made treats made in front of their eyes..
[Translate] If you are a die-hard fan of pastry god (at least in my eyes but everyone else calls him the “Picasso of pastry”), Pierre Hermé, you should consider to go to Pierre Hermé Aoyama (Japanese website) in Shibuya, Tokyo. Reasons for this is because it is Tokyo’s flagship location; it’s bigger than its flagship in Paris on Rue Bonaparte (I’ve been there in 2010) and comes with a sit-down café called Bar Chocolat on the second floor. 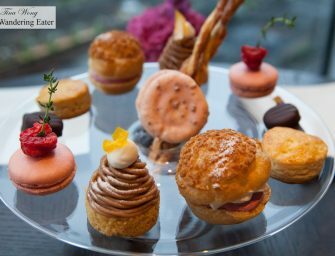 No other Pierre Hermé boutique has a sit-down café to enjoy the beautiful and sometimes wonderfully unusual flavor combination pastries and plated..